Micah is feeling much better. He came through his recovery great! I was so surprised to see how much different his recovery was from Bella's, but I attribute that mostly to the pain medication and his personality. He went back to school yesterday and the only residual problem he has is fatigue. He has been very tired and whiney, but that will get better too. I took a picture of him the day he started feeling better and the smile says it all. And this is a picture of Bella the day she starting feeling better. Today was up and down. The night was really rough. I tried to give Micah his medicine at 11 when I went to bed but he would not take it. I knew he was hurting but I couldn't get him to wake up enough to rationalize with him. So I decided I would leave him alone and let him go to back to sleep. My thought was that he would wake up later and want to take it. Well, I was wrong. He woke me up at 3 am moaning in his sleep. I started trying to wake him and he became very upset and started crying. Trying to rationalize with a child who is in pain and half asleep is next to impossible. After about 20 minutes of trying to coax him to take his pain medicine, I finally decide I need Michael, so I wake him up. And 25 minutes later, he takes his medicine. I don't know what I am going to do the rest of the week because Michael leaves town tomorrow until Friday. On top of Micah's recovery, Aria has also been giving me a VERY hard time with going to sleep at night. She gets out of bed, tears up her room playing, knocks on the walls...you name it, she's doing it. That wouldn't bother me too bad but with Micah being sick and needing me I don't know how she is going to do. I am just claim the verse that says, "My grace in sufficient for you." Sufficient is defined as "enough to meet the needs of a situation or proposed end." I am once again going to rest on that because that is all I have and God has never let me down before. Micah has had cabin fever really bad. He is asking to go back to school. He misses his teacher, he misses his friends, and he told me today that he misses P.E.. But, the one thing I can say is that since he has been home we have been reading alot. He has been reading some easy reader books and he is doing really well. I am amazed at how he is picking it up. I will be glad when he goes back to school, but I am going to miss the one-on-one time with him. I just want my baby to feel better...soon. Ok, so today was a very rough day. The pain and not being able to do anything is taking it's toll on Micah, and consequently on me too. He did not sleep well last night and is extremely tired today but will not lay down long enough to take a nap. He has cried and whined all day long. I am trying to be very patient but this evening I am feeling at my wits end. He got upset with me because I wouldn't lay with him, mainly because the house is a wreck and his sisters are needing me too. For those of you who are reading this, please pray for all of us. Between his recovery, Aria fighting sleep at every opportunity, and Isabella feeling very left out in the process, we are all wearing very thin around here and we really need your prayers. Another really good day. I must say that I am beginning to believe that the reason he is doing so well is because of the prayers of our friends and family. That is the only thing that makes sense. Last night I decided to let him sleep and only give him his medicine when he woke up. That wasn't really the best decision because when he did wake up he was in ALOT of pain and I had a hard time getting him to take his medicine because it burns so bad when it goes down. So, tonight I will probably wake him up so at least he isn't in pain. Unfortunately there is no real good answer when it comes to the nighttime. The one thing that does help though is putting a little bit of gatorade in the pain meds. Today everyone went to church and Micah and I stayed home. We had a good time just cuddling and watching movies. He has a real bad cough today and I am not real sure what that is about but it hurts him to cough. He tries not to but it is one of those coughs you can't control and then it's real loose so it hurts. We had a little bout with nausea this afternoon but I think it was because I gave him his antibiotic on an empty stomach. He was pretty puny all afternoon. He listened to his iPod most of the afternoon and he wanted to watch basketball with me. We watched the Auburn/Arkansas yesterday and today we watched the Laker/Spurs game. Since he's playing basketball and I am learning the rules of the game I am enjoying watching the games more and more with him. I am definitely a bigger sports fan than my husband is but he will sit and watch basketball with us. So, it was fun. Last night went alright, except that he got very irritated and said several times that he wished that I would quit waking him up and just leave him alone. I really don't blame him, when you are sick and tired you really don't want to be bothered with taking nasty medicine. He did it though like a trooper. Today has been a pretty good day. We haven't had to give him any more anti-nausea medicine, so that is good. He has been really tired today and not as tolerant of his pain or being cooped up at home. We decided to get out today for a little while and just go to my sister-in-law's house and visit with them. He did pretty good. Eating today has been very difficult. We have tried soup but the saltiness of it hurt. We tried ice cream, popsicles, jell-o, pudding, but the cold hurt. He tried very tiny little pasta but he said that hurt too. My only comfort is that he is drinking. He is already so thin as it is, only 46 pounds at 6 years old, and he is losing weight through all of this. But, as long as he is drinking I feel alright. We did get him to eat a little bit of Cream of Wheat with brown sugar in it for dinner. He didn't eat much, but four bites was good enough for me. He has been very clingy with me today and wants me to lay with him alot. I have been alright with that because Michael is home and he can take care of the girls. We are all going to be early tonight. All in all, I have been extremely impressed with him through all of this. He is really a warrior! Ok, so last night we had a pretty good night. One thing I am doing different this time is I am waking him up every four hours to get him to take his pain medicine. With Isabella I would just let her sleep and when she woke up I would give it to her. The bad thing about that is she would wake up in REALLY bad pain and getting her to take the medicine was difficult. I woke Micah up both times last night, 10:30 and 2:30. He did pretty good. The hardest part was waking him up enough to get him to realize what I am doing. I mix the HORRIBLE tasting medicine with a little bit of gatorade, which seems to cut the strong alcohol smell and taste. The other thing I have to do it say, "On your mark, get set, GO!" I did this once and now I have to do it every time!!!! It's so cute. He is such a boy! He woke of this morning pretty early so we watched tv and he started to get hungry. I made him a scrambled egg but he couldn't eat it. We tried jell-o but that didn't work either. I gave him a little ice cream and he ate a little of it and then said he was getting sick to his stomach. We went through this with Isabella so I was prepared. With Isabella we got a anti-nausea medicine in suppository form, well she was not about to let me give that to her and who could blame her. I don't know anyone over the age of 3 who would "allow" someone to give them a suppository. So, she chose not to take her pain medicine and only take Tylenol since the pain meds made her sick to her stomach. So, with Micah I got a liquid prescription just in case he got nauseous. How could I have known that it would be electric green in color, not a very appetizing color when you are nauseous, even if it doesn't taste bad. After arguing with him about the color I gave him an ultimatum, green liquid or suppository. Being that he is much more rational than his older sister, he opted for the liquid, took it like a champ, and felt better within 15 minutes. So, if you or your child EVER have your tonsils out, make sure you ask for liquid Phenergan to combat nausea. After he took all of his meds, he was almost back to his old self again. He ate really good, including a Nutragrain bar. My sister-in-law and I even caught him breakdancing to High School Musical musical. He is unbelievable really because his sister and his 16 year old cousin, who had hers done last week, were both in bed for 4 days and back in bed on day 6. Either he is like his mother and has just a very high pain tolerance or he is going to hit a wall at some point. We are hoping for the first, preparing for the latter. All in all, day two has not been so bad thanks to pain and anti-nausea medicine. Today is the big day. We got up at 6am and left to go to the hospital. We had to be there at 7am to register and start prepping him. On the way to the hospital he started crying and saying, "I want to go home. I don't feel good about this." This doesn't sit well with me because I have heard stories about people getting ready to do something and they have a "bad feeling". They decide not to get on the plane and the plane crashes, they have a bad feeling about going into work so they don't go and two planes hit the World Trade Center, etc. There are plenty of stories about stuff like that so when my son had his "bad feeling" I immediately started praying. "Lord, if Micah's bad feeling is something, then give me the feeling too, if it is just fear, then give us peace." I, obviously, never got the bad feeling. Micah still had the feeling when we got to the hospital and wouldn't let go of the seat to get out of the car. I said the prayer again, "Lord, give him peace," and his daddy picked him up out of the car and Micah began to calm. 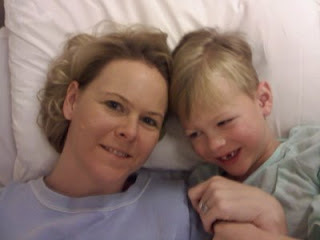 By the time we got to the Outpatient Surgery Center, Micah was smiling again. We registered him and they called us back to a room. Thank you God for the Holy Spirit who is our Comforter. After a little while, they came back to get him to put on a surgery gown. They told me he could leave on his underwear and socks but he needed to take off everything else. Well, we took him to the hospital in his pajamas and when I went to take them off he grabbed ahold of his pants. I asked him what was wrong and he informed me that he had slept "commando" last night. Oh great!!! 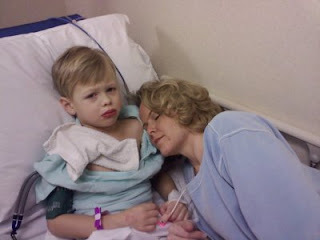 I prepared for everything, a toy to take into surgery with him, refrigerator and freezer stocked with post-surgery treats, notes of questions to ask Dr. Aland that I didn't realize I needed to ask until after Isabella's surgery, everything, but I did not prepare for THIS! The nurses where nice enough to allow him to leave his pajama pants on. My son's dignity spared!!! 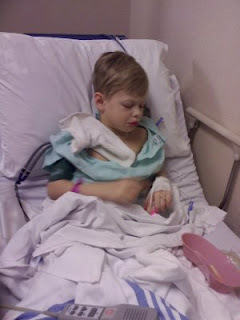 About 30 minutes before the surgery they came in and gave him a liquid sedative to calm him before they took him. It helps them stay calm, then when they take them to surgery they put them out with gas. Once he is out they give him the IV. When we went through this with Isabella she was fine when the medicine first starting taking effect, she got a little goofy and the calm. But, after a little bit she started crying and freaking out. And when I say freaking out I mean she started crying and talking incoherently. She got very frustrated because she could talk. The only thing I could make out was, "Pray Mommy Pray!" It scared me and it was all I could do not to break down crying in front of her. So, with Micah I mentioned this to the anesthesiologist. He informed me that children can only handle the effects for about 15-20 before they begin to "freak out" so I requested that he wait until 20 minutes before they were ready for him to give him the "cocktail". They gladly agreed and it was a much better experience. 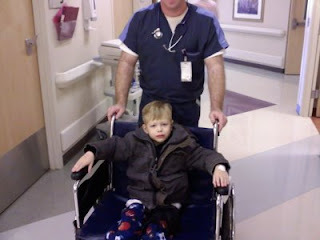 They wheeled Micah out and my darling husband had a hard time because Micah was reaching for his hand as they wheeled him away. You know, it is one of the many moments in a child's life when a parent watches a child go somewhere where the parent has no control and all you can do is pray that God will bring your child back to you safe and sound. It is a very scary and helpless feeling. Even though the surgery only lasts about 30 minutes, it is the longest 30 minutes of our lives. The clock just ticks away. It's terrible. After about 45 minutes the doctor came and said that he was fine. The surgery went great and we will be able to see him in a few minutes when he wakes up from the anesthesia. A few minutes later we are reunited with our little guy and have to wait about 2 hours so they can monitor his vital signs and get him drinking. We were home by lunchtime. The rest of the day he did great. He drank alot of gatorade, ate popsicles and jell-o, and played video games with his daddy. He is taking pain medication and antibiotics. Now the healing begins. 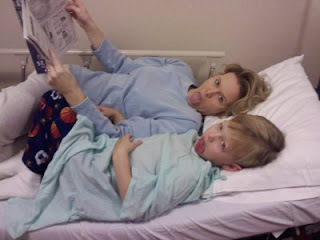 So, Micah is going in tomorrow to have his tonsils and adenoids out. Isabella had hers out last May. Both of the children have suffered from snoring and sleep apnea because of their tonsils. I didn't blog about Isabella's experience because she had a very rough time and even though I thought about it I was too warn out to do it. With Micah I wanted to do this because being one of the most common surgeries in children it might help other people to know what to expect. I didn't have alot of this with Isabella but what I did have REALLY helped. So I will blog daily about what goes on during the next week or so. On Tuesday our little girl turns 3. Unbelievable, it seems like only yesterday that I was bringing her home from the hospital. Now she is officially a little girl and no longer a toddler. We had her party yesterday and she had a blast. We had a Princess party, complete with makeovers, pictures on the royal throne, a craft where we made picture frames to hold our picture, and lots of dress-up stuff. I even dressed up in my sister's VERY large wedding gown and wore a tiara. The girls thought it was great! And believe it or not, I was ultra-organized and did not stress out at all. We just had alot of fun. Here are some pictures. And of course no princess birthday party would be complete without the birthday girl getting caught picking her nose on her royal throne.